CHICAGO — The Minnesota Twins have experienced difficulty finding ways to win games this season. So, at least temporarily, manager Paul Molitor decided things needed to change at the top. Removing Brian Dozier from the leadoff spot for the first time since 2016 did the trick on Friday for the Twins. Now, Minnesota will look to put together back-to-back victories for the first time since early April when they face the Chicago White Sox on Saturday at Guaranteed Rate Field. Molitor batted Joe Mauer in the top spot Friday when the Twins pounded out 12 hits and produced a 6-4 victory over the White Sox. 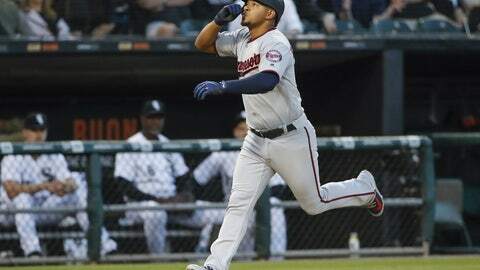 Minnesota got home runs from Dozier, Eduardo Escobar (twice) and Logan Morrison. But getting Dozier going may have been the biggest plus after the second baseman broke a 3-for-40 slump with a home run and a triple. Twins right-hander Lance Lynn will also attempt to get on track. Lynn (0-3, 8.37 ERA) has allowed 17 earned runs in his past three starts and has surrendered six in each of his past two. Lynn, who is in his first year with the Twins, has been hit hard during his first season in the American League and hopes to find a groove against the White Sox. Lynn is 1-0 with a 1.40 ERA in three career starts against the White Sox. The White Sox counter with Hector Santiago, who will make his second start of the season. Santiago (0-0, 3.48) has appeared in eight games but didn’t start until April 29 when he allowed two runs and scattered five hits in 4 2/3 innings against the Kansas City Royals. Santiago is 3-2 with a 4.19 ERA in six career starts against the Twins. After White Sox starter Carson Fulmer got roughed up for four home runs on Friday, Santiago will attempt to learn from Fulmer’s mistakes — something Fulmer said will be key for Chicago’s rotation throughout the season. As what has already been a tough start to the season continued Friday, the White Sox again saw second baseman Yoan Moncada deal with injuries. Moncada left the game in the fifth inning after not playing on Thursday and leaving Wednesday’s game early against the St. Louis Cardinals. Moncada has been bothered by a sore right foot, a tight left hamstring and a sore left thumb. After leaving Wednesday’s game, Moncada told reporters the injury is nothing serious. “It’s just a little tightness,” Moncada said.